Where are all the Democrat stalwarts, the princes and princesses of liberal lies, like Schmuck Schumer, Batshit Crazy Pelosi, and Debbie Wasserman Shultz? How about the party king and queen, Barack Hussein and the Wicked Witch of Benghazi? Schumer made a fool of himself and totally destroyed his career with the poorly-engineered government shutdown, Batshit can’t get a complete sentence out of her mouth and her nervous twitches are proof that those over 300 years old should not touch prescription narcotics. As for Barack Hussein and Hitlery, they are up to their chins in FISA abuse stench and are likely building palatial retreats in countries without US extradition treaties, not that that will help them – US Special Ops can go anywhere. It is now time to begin revoking many Democrat passports. 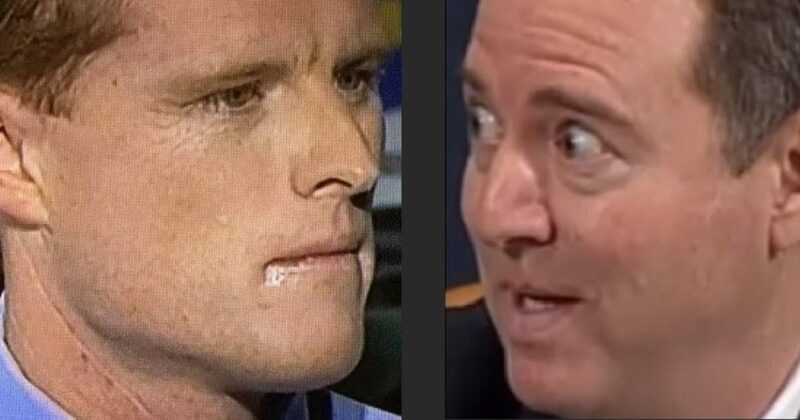 It may not help the Democrat cause that Joe Kennedy, III (left in the photo, above) slobbers like a bloodhound, such a distraction that listeners cannot hear a word the drooling dud says. In Joe’s defense, he claims that what appeared to be drool at the corners of his mouth during his State of the Union rebuttal speech was actually Chap-Stick, which begs the question, “Is the Democrat Party so broke they can’t afford a makeup artist to prep their speakers before going onto prime time national television?” A little powder would have made whatever that distraction was invisible. If I were the Democrats, I think I would cut my losses and stick to drool story. Then there is Adam Schiff, who appeared out of nowhere to become one of the fresh new faces of the Democrat Party. Schiff (right in the photo, above) looks like he is perpetually terrified. Or, maybe he doesn’t just look that way, maybe he actually is perpetually terrified. He certainly has reason to be. If these are the best the Democrats can put out front as standard bearers for their party, then they are in serious trouble. Like I said two years ago, the Democrat Party is dead. They just don’t know it yet. The election of President Trump has put the hot spotlight of truth on the swamp rats from the left. America can now clearly see exactly who they are. I don’t see how they can ever recover. So, considering that Kennedy and Schiff are, at best, poor representatives for their party, who do you think would represent the Democrat Party best? Take our poll, below.